Many of our reports have focused on the importance of skills in the civil service, from the shortage of skills in specialist areas (see, for example, our post on digital skills) to our recent report on the Use of consultants and temporary staff to fill skills gaps. Naturally, the NAO is a highly learning-focused organisation and our Learnfest includes plenty of sessions on statistical techniques, audit, and accountancy topics. But Learnfest is particularly about encouraging our people to try out something different, to mix with people with whom they don’t normally speak, and, simply, to have fun. “Whenever I mention Learnfest to people in other organisations it is always met with the same response: “That sounds fantastic! I wish we did that – it’s so amazing that your job invests so much in your development”. So, first, the basics. 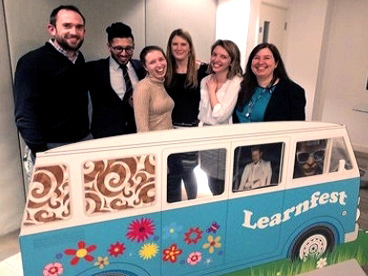 Learnfest is a week of sessions – big and small – run across both of the NAO’s offices. It’s really powerful because all NAO people are invited to run sessions or to ask their contacts to come in and speak. Yes, some sessions are run by our learning and development teams, but most aren’t. And we have a no refusal policy (well, almost). Anyone who wants to run a session, can. If only four people want to come along, that’s ok; if we are hugely overbooked, we’ll run more sessions. Our most popular internal sessions were a session on accountability in the world of cycling, a session from an NAO person currently on secondment at the Houses of Parliament, and one on Myers Briggs. For the first time each of our Non-Executive Directors delivered a session and these were really positively received. 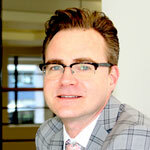 Henry Stewart, author of The Happy Manifesto, who ran through some simple ways to make the workplace happier. Roger Steare, the Corporate Philosopher, who led a moving discussion on how we can bring more humanity into the workplace. Janet Hughes from the Government Digital Service, who facilitated a thought provoking session on how we can all be a bit bolder. Yes, it takes a dedicated team a while to organise all of this, and the week itself is a whirlwind for the team as we battle with slide shows, collecting visitors, answering queries, changing venues and running social events. But, we sit in one room for the week, and we have a real blast. 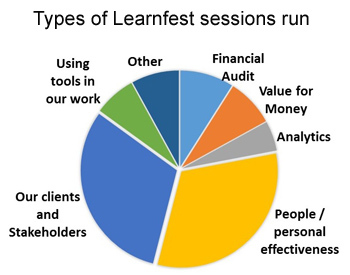 All in all, Learnfest delivered over 2,575 attendances across 96 different sessions (29 by external speakers) and 92% of people surveyed said it was a success. Participants said that they had gathered new ideas, made new connections with colleagues, and enjoyed time to reflect on how they could improve the way they work. 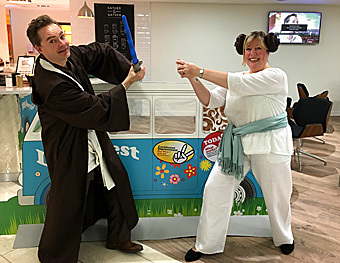 My favourite bit was getting to dress in a Jedi costume (mine, at no cost to the taxpayer) and run sessions on Myers-Briggs personality types linked to Star Wars characters. It was fascinating watching teams of introverts (like Luke Skywalker) and extroverts (like Han Solo) design a layout for the Millennium Falcon. So we will certainly be running Learnfest again next year and I would be delighted to talk with anyone who would like to contact us about the approach. About the author: Steve Mirfin has been the NAO’s Head of Learning and Development for the last 18 months. Prior to that he was a financial audit manager auditing organisations such as the Historic Royal Palaces, Bodies in Northern Ireland and the Research Councils. Steve joined the NAO in 1990.